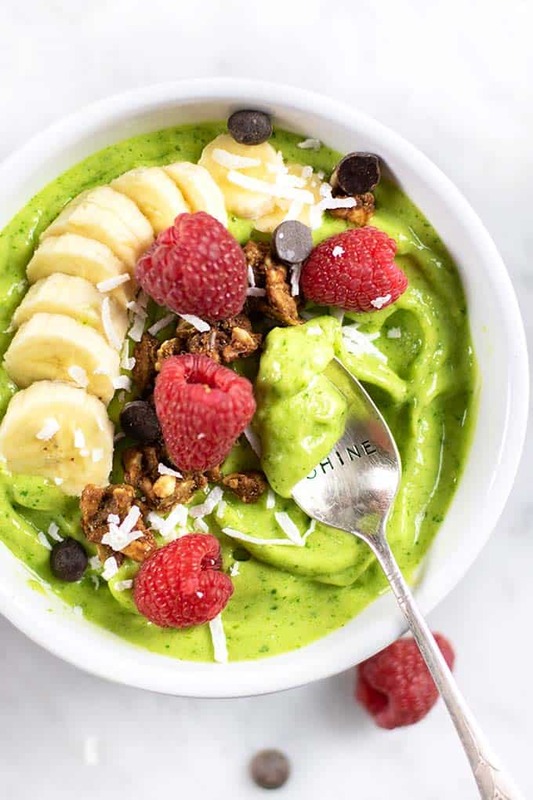 Learn to make the best Green Smoothie Bowls! I like my smoothie bowls to be thick, like sorbet or soft serve ice cream! 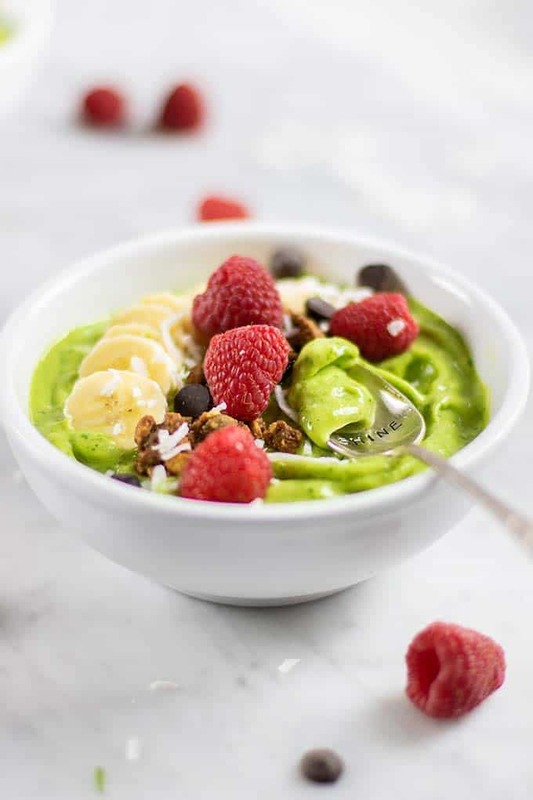 Read about how to make the perfect textured vegan green smoothie bowl! This post is not sponsored by Nutramilk. However, I have worked with the company in the past and received a free machine to test. Read more about the Nutramilk nut milk, butter and smoothie machine. There are lots of different combinations of fruit and vegetables that are great in smoothies and smoothie bowls. This is a simple and delicious combo that is easy to make and even easier to eat. I love starting my day off with fruits and vegetables — and if it’s as fun to eat as ice cream, double score! Dragon Fruit, also known as pitaya. I also like to use my food processor, rather than a blender, to keep the consistency of these more like ice cream than a smoothie. Because, you don’t want your toppings to sink! Once your fruit is frozen, add it to the food processor bowl, along with something liquid, like coconut milk, almond milk, yogurt (I used coconut Greek yogurt here! ), or even coconut water. I have a Nutramilk, and it has a handy smoothie and nut butter attachment — which makes the most dreamy textured smoothie bowls! 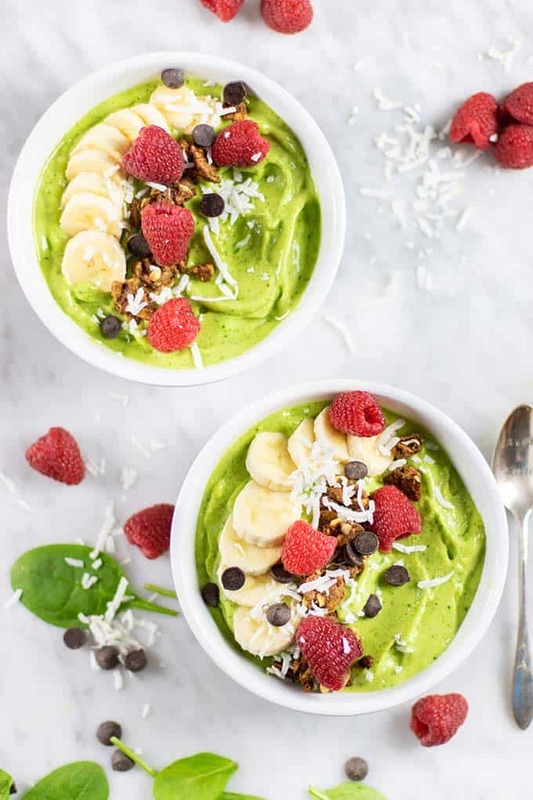 How do I top my Smoothie Bowls? The next step is the fun part! TOPPINGS! My toddler loves these — we all them “green ice cream.” And I love that we are sneaking in a serving of greens. 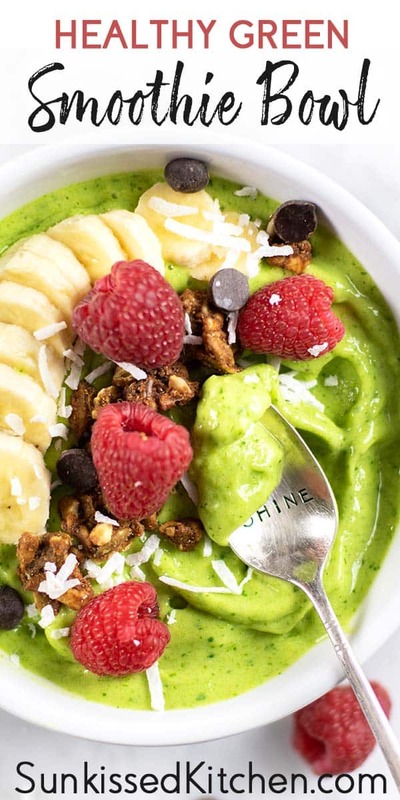 Smoothie bowls can be packed with sugar. Adding some natural yogurt or unsweetened coconut yogurt, plus greens, lowers the overall sugar. 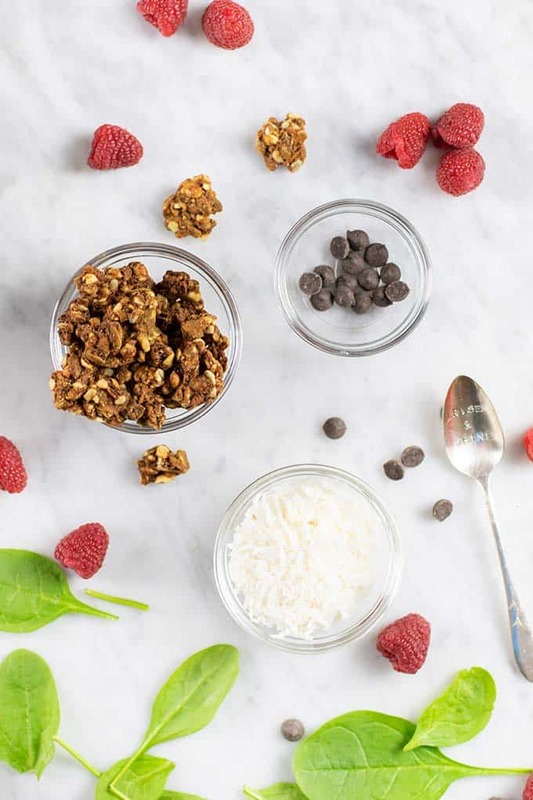 Using protein-rich toppings, like grain free granola and nut butter are other ways to balance the sugar-rich fruit. Also remember that the natural sugars in fruit are accompanied by lots of fiber and nutrients our bodies need! 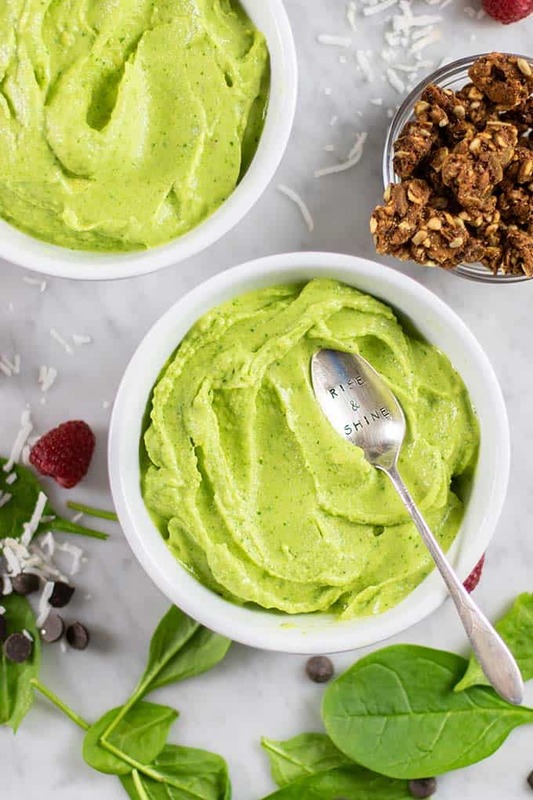 A creamy, soft serve consistency green smoothie, topped with a variety of delicious toppings! The perfect breakfast or dessert. 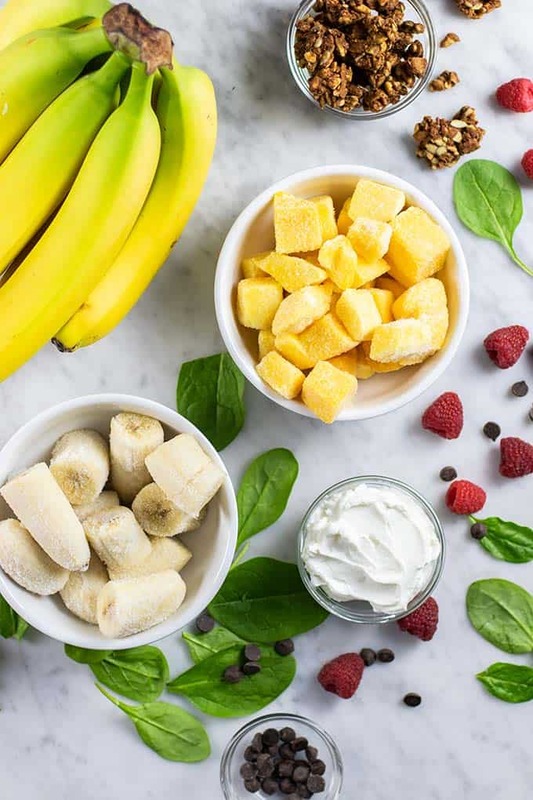 Be sure to start with frozen bananas and mango for the best textured smoothie bowl. 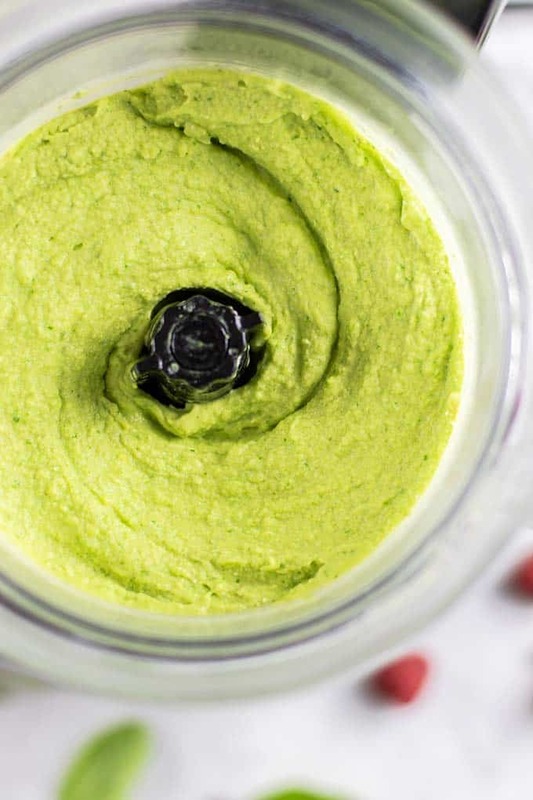 Add all ingredients to a food processor bowl or a Nutramilk nut butter and smoothie attachment. Process until the mixture becomes super creamy and begins to lighten in texture. Top with granola, fresh fruit, nuts, nut butters, coconut, or chocolate chips. *Nutrition facts are for the smoothie base, and does not include toppings. 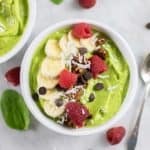 This Vegan Green Smoothie Bowl post may contain affiliate links, meaning if you make a purchase, I will receive part of the sale as a commission. This helps me continue to bring you lots of fresh and inspired recipes!